PRODUCT DESCRIPTION: Bait for moles which uses grubs and worms as attractants – primary food for moles and tastes which they love. The smell of the bait will get the always active moles to consume some. Once a lethal dose has been consumed they will die in 2-3 days. 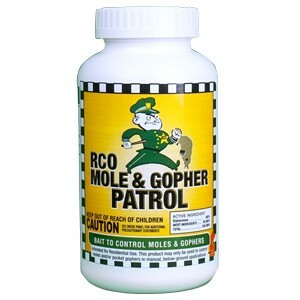 TARGET PESTS: Moles, gophers and other small rodents. WHERE TO USE IT: Every 8-10 feet down tunnels which are thought to be active. This is usually as close to the main den that you can make placements. RATE OF APPLICATION: 2 oz per tunnel; retreat every 2 weeks if new tunnels or holes appear. Have been using for a couple of years with good results. Best mole stuff out there! We live in the country, so we get our share of moles. They make a huge mess of the yard with the tunnels. When it rains, and you walk through the yard, you sink down into the tunnels and it's frustrating. 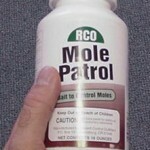 Mole Patrol is the best we've found. We buy here, because we get it in bulk. When new tunnels pop up, we get a stick from the woods and poke the holes in the nest areas and add the Mole Patrol. It's rare that we ever see anymore mole activity from this group again. Or course, new ones move in, but we deal with that too! We have 3 of our 12 acres that we keep mowed, and Mole Patrol helps keep it looking beautiful!